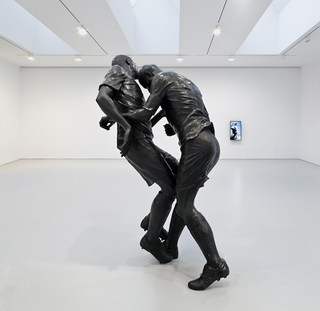 Among the works of Adel Abdessemed, now on display at the David Zwirner Gallery in New York, is this sculpture commemorating the ignominious, agressive end of Zidane's 2006 World Cup. So. Your art. What does it mean? Coup de tête depicts the moment French footballer Zinedine Zidane headbutted Italian Marco Materazzi in the 2006 World Cup ﬁnal in Germany in a heated response to a verbal insult by the latter. While it presents a realistic rendition of the event, Abdessemed's slightly larger-than life, resin sculpture is not so much a commemoration of the incident itself as it is a testament to the emotions and underlying narratives which often accompany major sports events. By distilling the moment of Zidane's much scrutinized violent impulse, Abdessemed's work draws attention to the verbal insults and provocations that often ﬂourish in the sport without any visible manifestation, and further emphasizes the obsessive interest in drama that lies beyond the game itself. Makes sense. Give you 50 bucks for it.